The primary goal of the Center for Muscle Health and Neuromuscular Disorders at Ohio State University (OSU) and Nationwide Children's Hospital (NCH) is to provide an enriching environment that maximizes the quality of research, finds cures to muscle and neuromuscular diseases, and promotes the next generation of scientists and clinicians to carry on our work. 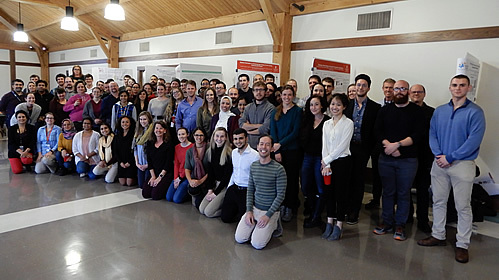 Founded in 2006 from a grassroots organization called the OSU/NCH Muscle Group, our center brings together investigators with diverse research interests in order to foster interactions among our labs so as to improve the quality of basic and translational approaches to treating muscle injury and disease. The center has now grown from 12 to 26 labs containing over 100 faculty, postdoctoral researchers, and graduate students spanning multiple disciplines of muscle and neuromuscular research. Through our membership, we create an interactive environment by holding seminar series, poster presentations, web courses, podcasts, workshops, and providing fellowships through the National Institutes of Health (NIH) specific to the training of our graduate students and postdoctoral fellows. We invite you to take a look through our website to learn more about our research and center activities. Click here to receive your shirt today!